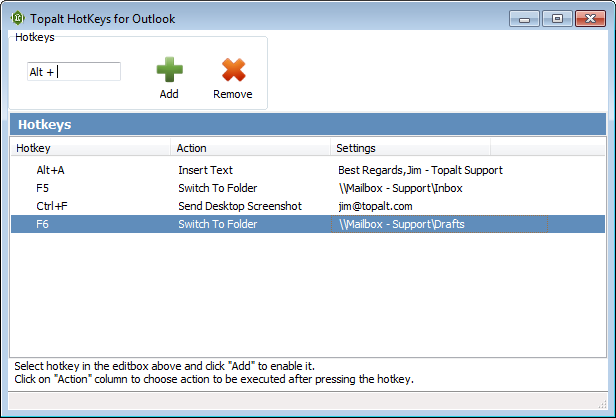 Improve your productivity with Topalt Hotkeys for Outlook. Create following hotkeys for Outlook with Topalt Hotkeys. Insert predefined text with a hotkey (canned responses tool). Quickly navigate (switch) between Outlook folders using hotkeys. Send a desktop screenshot with one click. Mark as read and move selected items to a predefined folder. Can create hotkeys to insert predefined text. Can create hotkeys to switch to predefined Outlook folder. Can create hotkeys to send a desktop screenshot to a predefined recipient. Can create hotkeys to move selected items to a predefined folder.